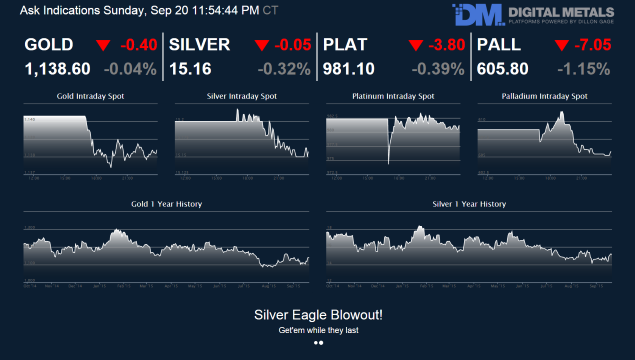 The world’s leading precious metals trading and technology services platform. FizTrade™ is powered by Dillon Gage’s leading edge technology that streamlines all aspects of physical metals trading for our clients. The platform caters to wholesale dealers, institutional investors and private wealth clients. As an international market maker, Dillon Gage provides clients with real-time, reliable spots and charts. This market data can be provided in a variety of ways. From a simple widget for displaying on client websites to sophisticated APIs (application protocol interfaces) for use in trading systems, brokerage platforms and more. When utilizing the API, clients are free to customize exactly how the information is utilized and displayed. Impress your customers and provide information to your employees. This data feed allows you to stream information, live spots and charts as well as select product pricing on your own HDTV screen. With a direct feed from Dillon Gage you are able to customize the message for your audience from the FizTrade dashboard. An email has been sent with a link to reset your email address. Dillon Gage Metals has specialized in physical precious metals trading for 40 years, developing services and techology tailored to the needs of dealers and institutional investors. Visit DillonGage.com for details on how we not only meet, but exceed the needs of our clients.